In 2016, I did the MSc in Space Science & Technology at University College Dublin. As part of that course, we stuffed a Tupperware container with some electronics, attached it to a high-altitude weather balloon, and sent it on its merry way — but first, let’s back up a little. A lot goes into making a satellite but it all begins with some science goals and these will determine the payload. For example, to study the oldest galaxies in the Universe, you might use an infrared telescope. The payload will then be dependent on many other subsystems: Solar panels are often used to generate power, a radio is needed to communicate with mission control, small thrusters are used to prevent the spacecraft from slipping out of orbit — the list goes on. There are many budgetary constraints that must be satisfied and this imposes limits on the goals and requirements. Let’s say you want to detect gamma-ray bursts with top-notch resolution. To do this, you might need a telescope which has to be cryogenically cooled. If the mission is to last ten years, you’d need a lot of liquid nitrogen. The rocket is a fixed size though so there might not be room for everything. This is one example but there are many others, such as a mass budget (the rocket will have a certain thrust to lift the payload), and a power budget (the solar panels can only be so big). Then there is the most important budget of all — the financial budget — which will influence every aspect of a mission. With enough money, you could develop new solar panel technology that is more efficient and thus increase your spacecraft’s power budget (but if you need development time that could impact your launch date). If you flick through the missions on the books at NASA and ESA (it’s European counterpart), you’ll notice that failure to adhere to financial budgets and time constraints is commonplace. The James Webb Space Telescope (JWST) is a noteworthy example. Originally scheduled to launch in 2007, it’s still on the ground, undergoing testing. When it’s shot into space in October 2018 it will be amongst the largest telescopes ever launched. It weighs in at a hefty 6.5 tonnes and the full spacecraft is comparable in size to tennis court. The JWST hasn’t come cheap, though. The estimated cost is $10 billion (roughly the GDP of Malta), well beyond the original budget of $0.5 billion. The primary mirror of the James Webb Space Telescope is gold-plated and measures 6.5 metres in diameter. For scale, note the scientists to the right who are working on it. To get a feel for the many different subsystems that make up a satellite, we built (in teams of four) a miniature satellite that fits inside a Tupperware container — also known as a TupperSat. It stems from the CubeSat idea, whereby small satellites are used for space research. I use the term “satellite” loosely here — a satellite is an object that is in orbit and our TupperSat was only going up to the stratosphere and back down again. On a similar note, I use the word “launch” but we used a high-altitude weather balloon, not a rocket, so it was more of a “release”. In any case, all of the same constraints discussed above applied, such as the mass and size of the TupperSat. The budgets were just obviously on a far smaller scale and were firmly fixed: The launch date couldn’t be moved and blowing through the financial budget wasn’t an option. Our TupperSat just prior to launch. The black tube is a collimator used to restrict the amount of light shining on the spectrometer. We devised a number of science goals and technical goals then set to work on the build. At the heart of our TupperSat was a Raspberry Pi. We included sensors to record the location and orientation of the TupperSat, the temperature (both inside and outside), the pressure, the humidity, the magnetic field strength, and the levels of visible, infrared, and UV light. We mounted a camera as well. We also built a spectrometer using some lenses and the CCD from an old webcam. We designed and printed any other parts we needed using a 3D printer. Then there were the less scientifically interesting but equally important parts, such as a radio and antenna to communicate with the ground station, thermal insulation to protect from the cold, a battery for power, a memory stick to save data, and a few structural parts to hold it together. One of the most challenging aspects was getting all of the components to talk to each other correctly. A spectrum of the Sun that we recorded during the flight. The spectral resolution wasn’t good enough to discern any features but at least it looks pretty. A GPS module was used to keep track of the position and there are a couple of points worth mentioning about this. Firstly, GPS, or Global Positioning System, is a navigation system owned by the US government and operated by the US Air Force. Its lesser-known but equally effective European counterpart is called Galileo. Secondly, there are velocity and altitude limits for GPS sensors, meaning that they’ll switch off if you send them too high and too fast. This is why you won’t get Google Maps to work on an aeroplane. These limits were put in place to discourage people attaching them to intercontinental ballistic missiles and aiming them stateside. We had to switch off the altitude limit for it to work correctly. This is an early 3D model of the design which shows of the internal structure. The cylindrical shell is the Tupperware container. We launched the TupperSat on a calm, clear day. The balloon was about one metre in diameter when we released it but the air gets thinner with increasing altitude, causing the balloon to expand. This is what causes the balloon to eventually burst — it becomes over-stretched. Before it pops, it can extend up to 10 metres across. To ensure the TupperSat itself didn’t explode, we made a couple of holes in it so as to maintain equilibrium with the atmosphere. We launched from St. Mary’s Primary School in Cabragh, hence the abundance of children. The TupperSat sent telemetry continuously so we could monitor it in real time. The game was afoot: We were in a car tracking its position via a portable ground station and chasing it insofar as that was possible. The TupperSat would go wherever the wind took it, whereas we were confined to the network of roads. It traveled farther than expected, landing over 60 km as the crow flies from the launch site. The launch site is on the left of the image. The balloon burst over Lough Neagh and quickly spiralled downwards near Antrim. It reached an altitude of 27.3 km (commercial aircraft cruise around the 12 km mark). It was in the air for just over two hours. It left the troposphere and was well within the stratosphere, peaking in the ozone layer. Towards the heavens, conditions are far less favourable than what we’re accustomed to. Wind speeds can reach 220 km/h at 10 km altitude. The temperature dropped to a chilly –55°C (while inside it was a comparatively toasty –11°C). The pressure dropped to just 1.4% of atmospheric pressure. The humidity dropped from 43% at launch to 1%. The level of damaging UV radiation increased with altitude which, on the ground, we are normally shielded from by the ozone layer. This is one of the images taken by the TupperSat as it rose above Northern Ireland. It gives us a sense of how thin the atmosphere is. If the Earth were the size of an apple, the atmosphere would be as deep as the apple skin. What goes up must come down. After the balloon reached the limit of its elasticity and burst, the TupperSat hurdled back to Earth. We were monitoring the descent and rushed to the projected landing site. We ran into a problem though — it landed within the confines of Belfast International Airport, between the control tower and the runway. Thankfully, the staff were pretty understanding. We explained the situation — that we were students, not terrorists — and were given a tepid talking-to regarding safety. The TupperSat was then back in our mitts. Admittedly, it was a little worse for wear but crucially still in one piece and still taking data. Even with the parachute, it was a rough landing but that wasn’t a problem. Unlike Elon Musk’s Falcon 9, our TupperSat wouldn’t be making another journey. This is a photograph of our TupperSat in full flight high above the clouds, taken by another TupperSat. In the end, we got some useful science out of it and it was the most useful way to learn about what goes into making a space mission possible. I glossed over a lot of the specific issues we ran into but the take-home message is that, when it comes to rocket science, the pertinence of Murphy’s Law can’t be overstated. A huge amount of preparation and testing is needed to iron out every foreseeable crease. Even then, luck might not be on your side. A pair of TupperSats belonging to our classmates landed squarely in the middle of Lough Neagh. They were eventually recovered after spending almost a year under water. We only had a handful of components to keep track of and it was only in the air for a couple of hours. 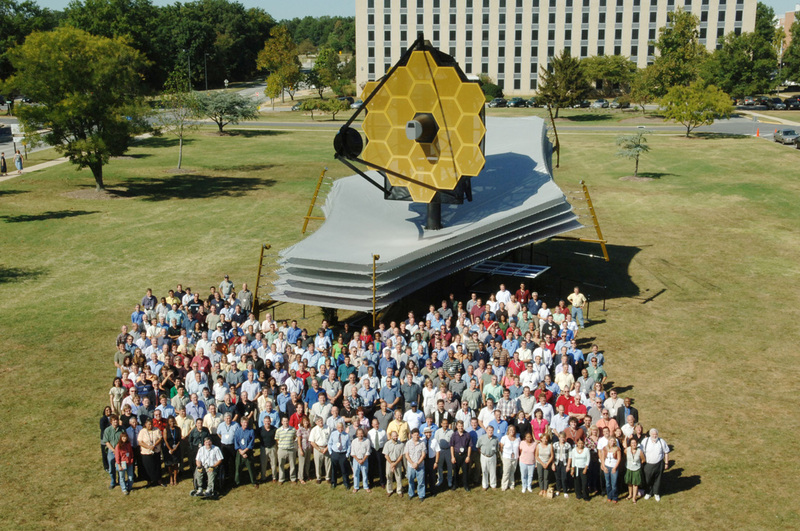 Something like the James Webb Space Telescope probably has many millions of parts. Even with a component failure rate as low as 0.001% per year, a hundred things will break during a ten-year mission and, as it will sit a million kilometres from Earth, there’s no hope of fixing it. To minimise errors in daily life, plan and check everything you do like it’s going to space — but even still, the best made plans go awry.